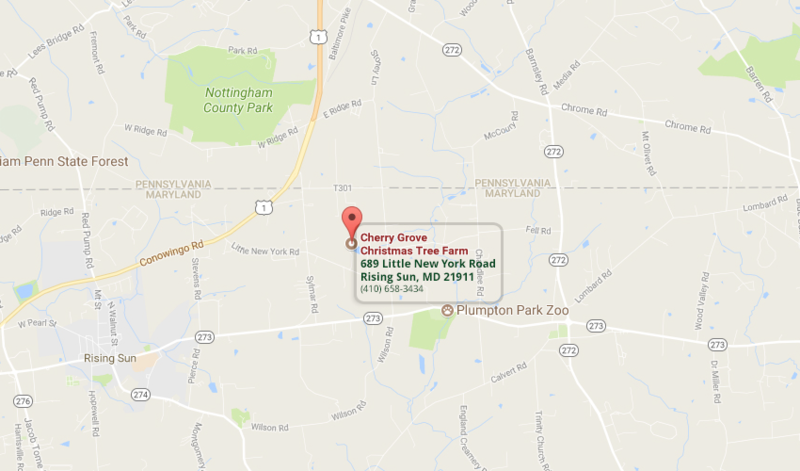 Cherry Grove Christmas Tree Farm is located in northern Cecil County just south of the Pennsylvania state line and we are just 15 minutes away from Newark, Delaware. Maryland Route 273 – 1.5 miles East of Rising Sun, turn north on Sylmar Road and follow the signs. From Newark, Delaware – From Main Street go West to Maryland Route 273 for 13.5 miles, turn right on Sylmar Road and follow the signs. From Interstate I-95 – Take Exit 100N to Route 272 North, turn left (west) on Route 273, then 2.5 miles to Sylmar Road (turn right) and follow the signs. From U.S. Route 40 – At North East, Md. take Route 272 North to Route 273, turn left on Route 273, then 2.5 miles to Sylmar Road (turn right) and follow the signs. From U.S. Route 1 – .7 miles South of the PA/MD line to Little New York Road and follow the signs.